Many thanks to Roger for this insightful and enjoyable analysis of this classic Django photo! Looks like Django's playing a classical guitar in the photo. Thanks for the great analysis! Looks like Django's playing a classical guitar in the photo. ....... but it does have a tailpiece. Wow! Your eyes are better than mine, Teddy! Thanks for a fascinating post (I meant to click like instead of funny, I blame the iphone). @MarkA Fyi you can unclick and change it too. This is a photo of the actual Pan American Clipper that Django travelled to the USA on. 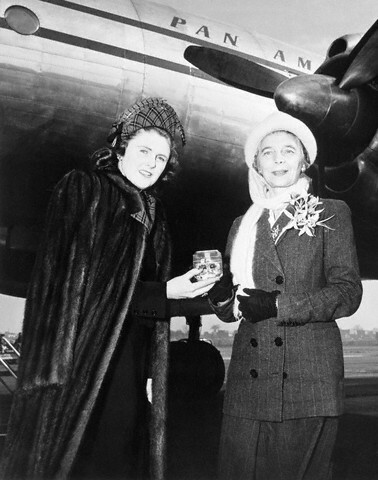 The two ladies are Pamela Churchill and Princess Matchabelli, both of whom are mentioned in the newspaper article. 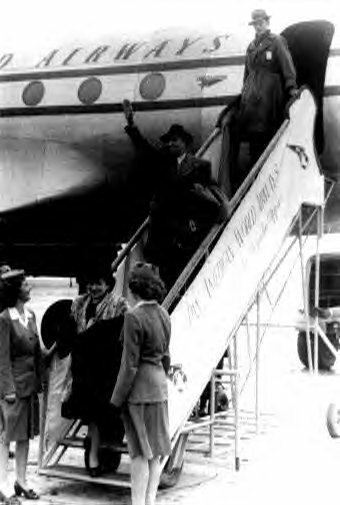 Django arrived in NYC with a Pan American Word Airways flight on a Lockheed Constellation L-049-46-26 named "Paul Jones".